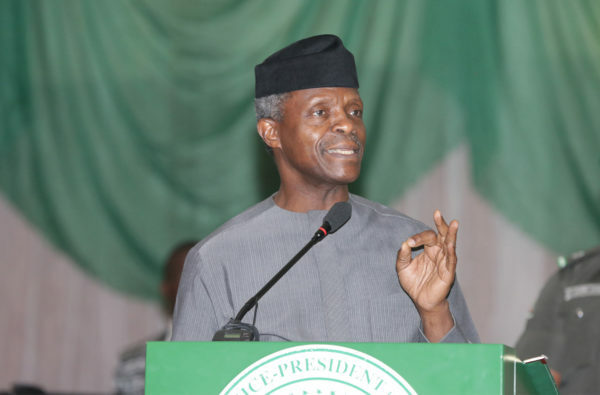 $1bn to be withdrawn from the Excess Crude Account is not meant for the fight against Boko Haram alone, says VP Yemi Osinbajo – Royal Times of Nigeria. VIce-President Yemi Osinbajo says the $1 billion recently approved by governors is not meant for the prosecution of the war against Boko Haram only. Osinbajo said this while reacting to the criticising that has trailed the release of the funds meant to be drawn from the Excess Crude Account. It could be recalled that the opposition party, PDP and Governor Ayo Fayose of Ekiti state have condemned the plans to withdraw the money from the Excess Crude Account. He said, “It was on account of the security summit that the governors at the Governors’ Forum subsequently decided that they would vote a certain sum of money, which has become somewhat controversial, the $1bn, to assist the security architecture of the country. It was to assist all of the issues in the states, including policing in the states, community policing, all of the different security challenges that we have. It was after the security summit that the Governors’ Forum met across party lines again, I must add, in order to approve and to accept that this is what needed to be done to shore up our security architecture.”.